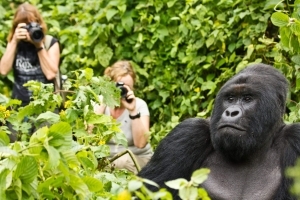 Created by the 5 stunning peaks, Volcanoes national park is the definite Rwanda gorilla trekking safari destination. The park hosts about 400 mountain gorillas out of over 1,000 mountain gorillas that still survive in the wild and the only park with mountain gorillas in the country. 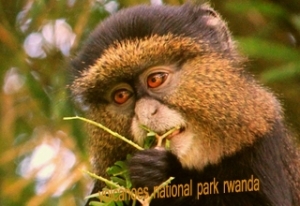 Volcanoes national park is situated in north western Rwanda in kinigi, Ruhengeri within the Virunga massif. The park sits in a beautiful greenery back drop of the verdant rolling hills of Virunga adjacent to Virunga national park and Mgahinga Gorilla National Park for Congo gorilla safaris and Uganda gorilla trekking safaris respectively. 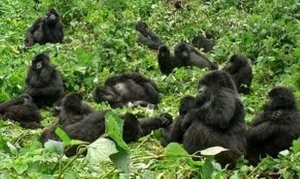 Many tourists tour Rwanda for gorilla trekking experiences but wonder how to plan a short safari in Rwanda. 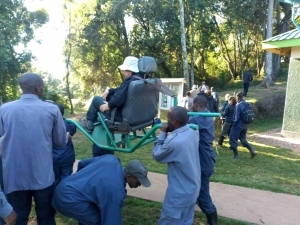 This 3 days gorilla safari in Volcanoes national park offers an opportunity to do other activities in Rwanda like a Kigali city tour, visit Dian Fossey tracking, do a canopy walk and golden monkey trekking. Upon arrival to Kigali international airport you will be welcomed by your tour guide. It is about 117km to Volcanoes national park taking a drive time of about 2h 22min. This is the best time to sight the beautiful rolling slopes of the land of a thousand hills. You will check in to your booked accommodation facility within Volcanoes national park for relaxation, dinner and an overnight stay. Alternatively, you can do a short city tour in Kigali before transfer to Volcanoes national park. Gisozi genocide memorial center in Kigali is the best stop for a comprehensive history of the massacre in Rwanda during 1994. This depends on your time of arrival in Kigali. After an early morning breakfast at the hotel, your driver guide will drive you to the park headquarters for briefing before 8:00am. 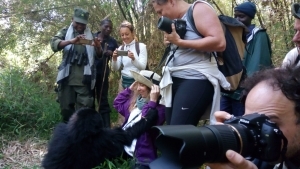 At the headquarters you will meet other trekkers, here a total of 8 tourists are allocated a single gorilla group to trek after being briefed on the Rwanda gorilla trekking rules. You embark on the trek with a park ranger and the time spent during the trek isn’t predictable since the gorillas are always on a move. Your guide will wait for you to complete your memorable gorilla safari in Rwanda activity and transfers you to your hotel for lunch then take an evening cultural tour for an African encounter. After the trek, if time allows you can visit the beautiful twin lakes in Rwanda (Lake Bulera and Ruhondo). On this last day of your safari, embark on a drive to the Dian Fossey tomb after breakfast from your hotel. This is a chance to learn about gorilla conservation and protection. Alternatively, you can decide to do golden monkey tracking. The driver transfers you to the airport in the evening for departure. The 2 nights accommodation is best recommended to be in one of the hotels or lodges that provide accommodation in Volcanoes national park for easy access of the park. When you arrive in Kigali international airport, your driver guide will be waiting for you. After a briefing about your safari, you embark on a drive to Nyungwe forest national park in Rwanda. 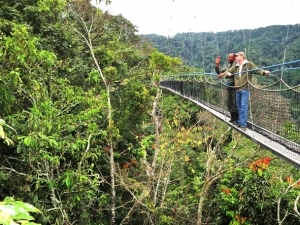 Nyungwe forest national park is 193km from the airport with a drive time of about 4h 15min. When you arrive at Nyungwe you check in to your booked hotel for dinner and an overnight stay. Alternatively, you can do a Kigali city tour depending on the time of arrival in Rwanda. In the morning your driver will transfer you to the canopy walk start point in Uwinka. The walk is one of a kind as you walk in between giant trees 60m above the forest floor and 90m long. 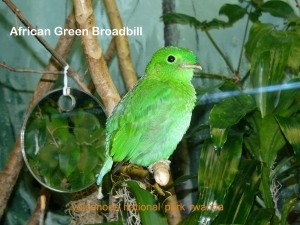 This is the best opportunity to have a taste of the air freshness in Rwanda with sighting of several forest bird species. 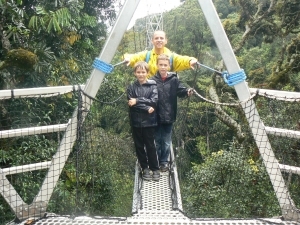 After the canopy walk, you transfer to Volcanoes national park for dinner and an overnight stay. In the morning, your driver guide will transfer you to the park headquarters for gorilla trekking. The trek starts at 8:00am after briefing and the end of the activity is unpredictable. Depending on the time the activity ends, you either take packed lunch or return to the hotel for lunch. In the evening, the driver will transfer you to Kigali international airport for your departure flight. These 3 days gorilla safari in Volcanoes national park inclusive of arrival and departure starts and ends in Kigali-Rwanda’s capital. See the world from above and get a new perspective of beauty when you visit Nyungwe national park on a Rwanda safari.